To take a look at what our newsletter will look like and for the chance to sign up if you like the look of it click HERE. We wont be bombarding you with emails but we'd like to keep you upto date with what's going on and like in the example share lots of pictures of upcoming models. We've had another run at it and any edits since the last version have been highlighted in red. We're getting closer to finalising the text now so if you have any comments get them in soon. The last wave of Bushido: New Dawn is approaching! This wave we have a new Ninja for the Kage Kaze Zoku exemplifying the arts of the sniper, a character version of the Hilltribe Hunter, a Master Monk who is entirely at peace with the natural world and the spirit world, a deadly Minimoto Ice Witch who adds a whole new dimension to the newest Bushido Faction and a terrifyning Oni model who steals the glory and power from other, younger Onisho kills. Also CRABS! 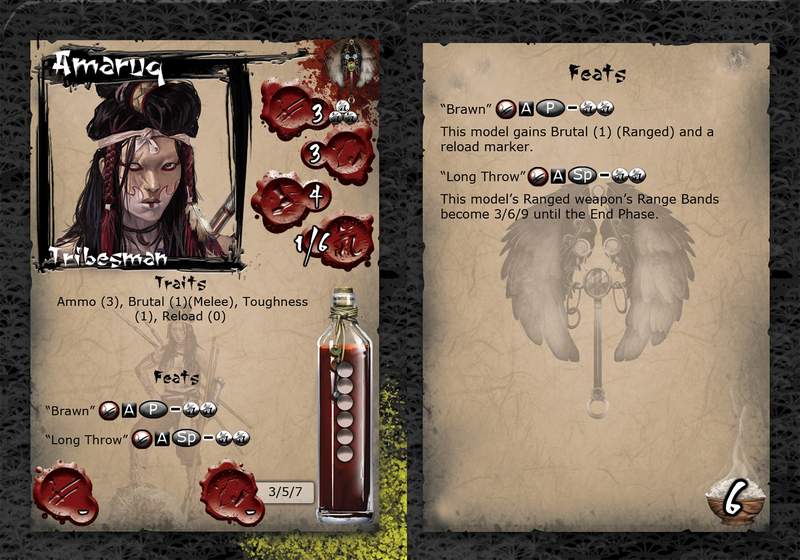 Amaruq is an exemplar of the Hunting techniques of the Hilltribe, and also a vicious combatant up close. She can take down prey from a huge distance with her Long Throw Ki Feat making her maximum range a very respectable 13" (With a Walk) and also is a very cheap model with the Brutal (Melee) trait which makes her a great melee model. The choice to take a regular Hunter or spend the extra rice for Amaruq will make for interesting list options for Descension players. Dudiko is a master of the Shadow Wind's half-bow. She liberally uses smoke bombs to mask her presence and shoots from such a distance that even targets who are aware of her can be caught out. Obviously other Ninja can utilise her bombs too, once she makes a cloud, meaning you have more cover on the board to play with. She can cause an enemy to be Surprised even if they are looking right at her! Combined with the Dead Eye Ki Feat she can shoot from Long Range and still do serious damage, if you combine her with poison she could do even more. She's not exactly a slouch in melee either, though she has many ways of getting out of melee to use her unmatched sniping ability with Side Step Defence, Mirage and a choice for Automatic disengage. Kimiko is one of the Hoshi family's Ice Witches. A Minor House, pledged to the Minimoto, the Hoshi live on the frozen peaks of the Iron Mountains and take almost no part in the politics or games at Court other houses delight in. 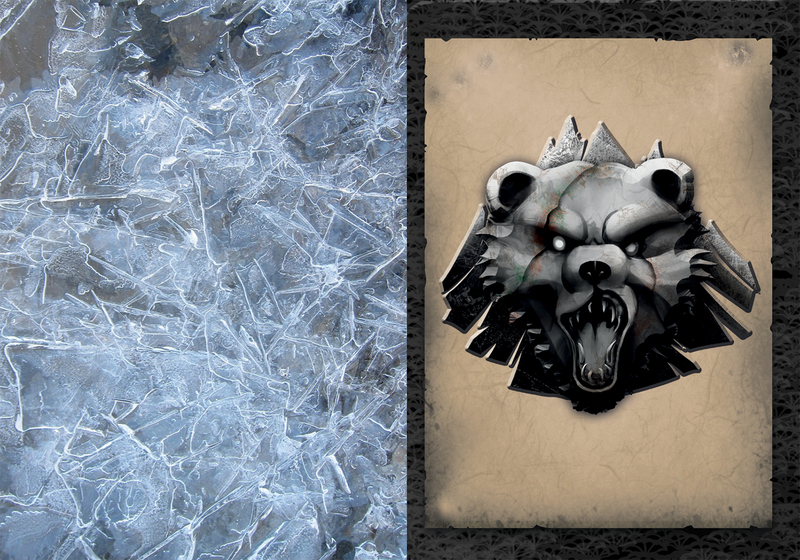 They are closer to the Kami of the mountain and many of their daughters inherit powers over cold and ice. One of the interesting aspects of Kimiko is that she lets you recruit a Kami of Reflection which offers invaluable defence against enemy opposed Ki Feats. If you don't recruit one she can summon one to the game, but this exhausts her powers and she can't play any further part in the battle. She also brings a great Ki Feat called Icy Veins which gives a model gains Fearless, Durable (Ranged), and Slow until the End Phase. Obviously Fearless and Durable against Ranged is a great buff for your own guys but this can also be used on enemy models, you have to weigh carefully its best use each turn. Some times you need the protection against Ranged, other times you need to Slow an enemy. 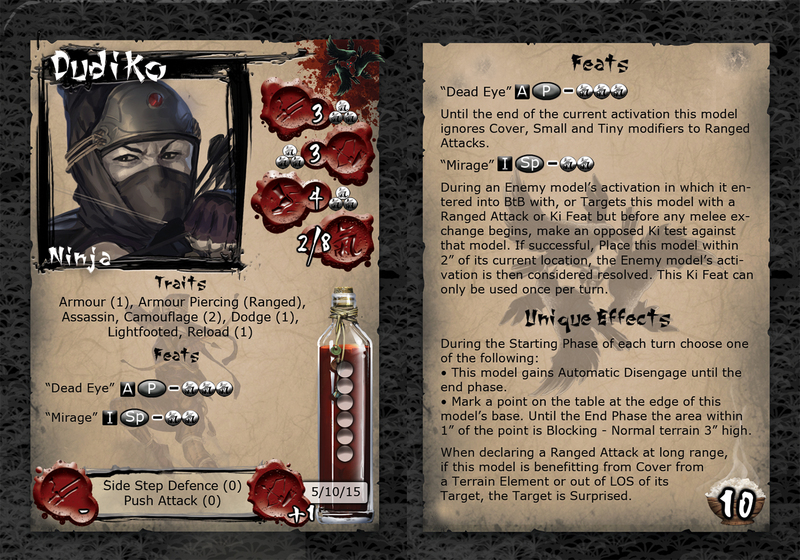 Finally before the game Kimiko lets you place an Icy Terrain card on the table which hinders enemy movement. This can be invaluable to slow the enemy progress as the Minimoto are the slowest of all factions. Combine these powers with her Samurai training (Giving her Martial Prowess) which is a good defence in Melee and she's going to be a real help for Bear Clan players in all kinds of lists. Master Koju is a Contemplative. Although a master of the Temple's martial arts, she prefers to spend her waking hours sitting motionless conversing with the Kami and seeking greater enlightenment. Koju learned to call forth all kinds of spirit, from the Kami of the local crossroads, the air and fire kami who often aid the Temple to some of the more important gods of heavens. Her enlightenment, of a sort, came when she was visited by the Kami of Time. This being has never communed with any other, mortal or god and Koju never speaks of what the Kami actually said but she was forever changed. She wears a blindfold and relies entirely on her knowledge of what is going to happen rather than mundane human sight and her feet no longer touch the ground when she walks. If she is in danger all of creation will bend to ensure her safety, and even the most depraved Kami representing the worst aspects of creation will not harm her. This often manifests as wild animals appearing alongside her to attack those who threaten her and her enemies slow down in her presence to allow her allies the opportunity to take out threats before they have a chance to reach her. Her Foresight Ki Feat is very powerful. Master Koju is not an amazing combat model (For a master monk!) but the support this feat offers is undeniably worth her presence in many lists. Essentially if you don't like the result of any melee exchange, you can re-make all your choices but your opponent is stuck with theirs! She can also make enemies slow in a pulse around her which can be game-changing in the right circumstances. 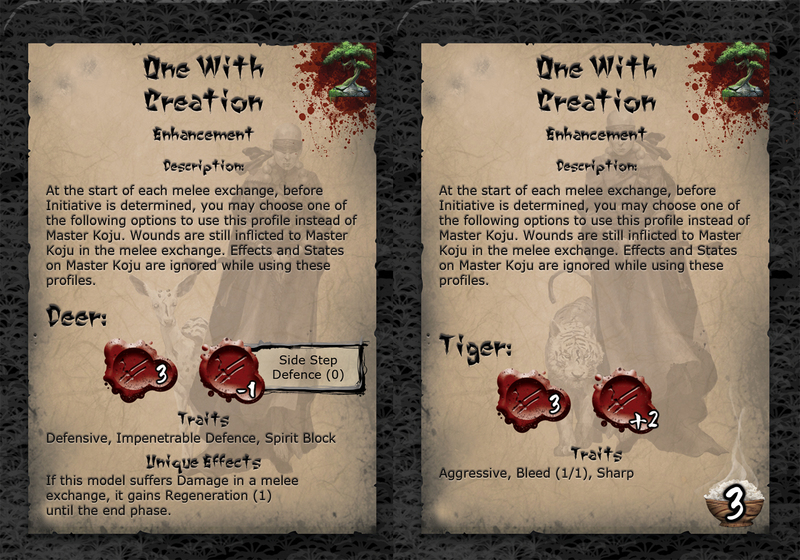 Koju comes with her own Enhancement card representing two wild animals that have come to protect her. Each Melee Exchange you can choose the offensive Tiger with his +2 Melee Strength and Sharp or the Defensive Deer with its healing ability. 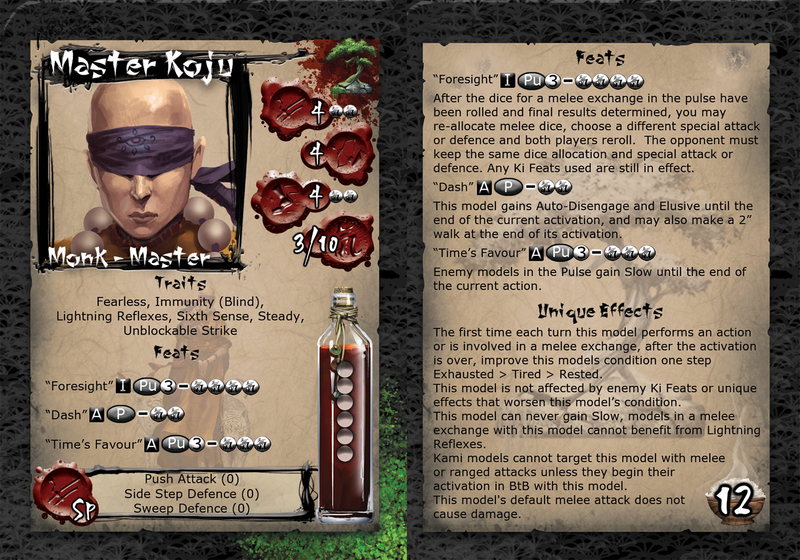 This adds a lot of options to Master Koju's melee toolkit and I hope provides a flavourful way to play this unique new character. Onyomi is an Oni mother who will rush to her Onisho and steal the power and the glory of their kills. Onisho fight harder when she is nearby, represented in game by her Inspiration Ki Feat which improves the Melee Skill of an Onisho model, do try to show they are strong enough to fight her off, indeed it is often seen as a sign that a young one is nearing adulthood when he can retain his kills. Still when they go for their kill, she may rush forward and steal it away. In game having a model Charge, out of sequence, for no change in condition is very powerful if you can set it up! 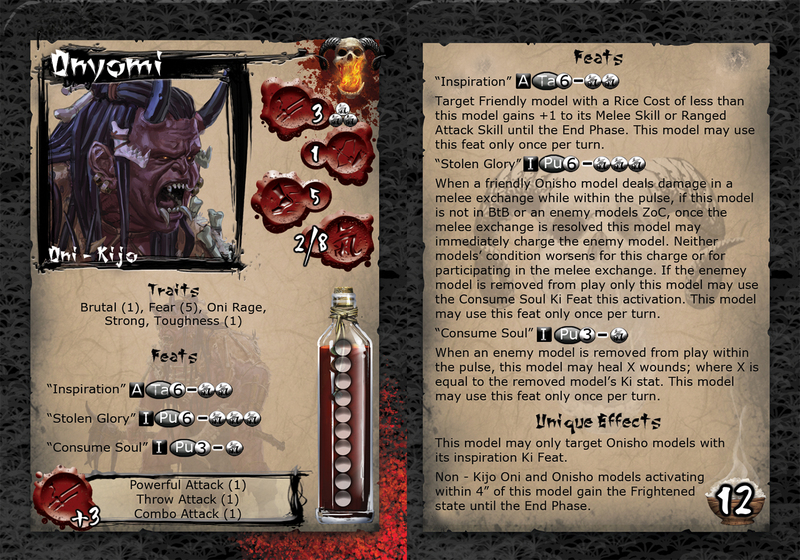 Onyomi is still a frightening prospect for other Oni and she causes all nearby models to become Frightened. This may be a disadvantage but also means you can worry less about Aggressive models and with the Inspiration feat too, she can make those models much more flexible. Finally, Jung Pirates are getting some Crabs of the Eastern Sea! With three different types and with low Rice Costs, I expect to see some of these in many lists. 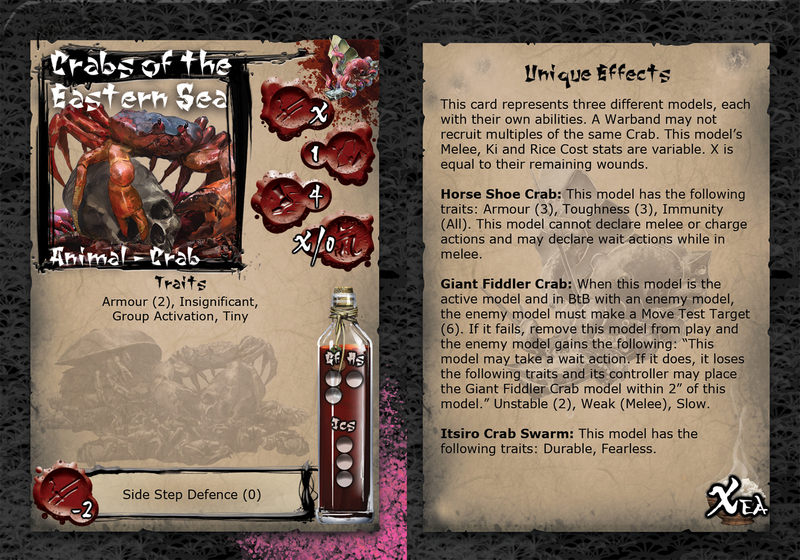 With the Swarms resilience and actually high Melee Skill, the fiddler Crabs huge claw that can grab hold of an opponent and cause him to suffer The Unstable, Weak and Slow traits, making that model easy prey for a pirate in melee or the Horse Shoe Crab's amazing Armour (3), Toughness (3) and Immunity (All) making it almost impossible to shift from a scenario point; each crab offers something different and may be just what you need to round out your list. Tell us what you think of these profiles and models on the forums. We're heading down to Guildford this weekend for Bonescon. 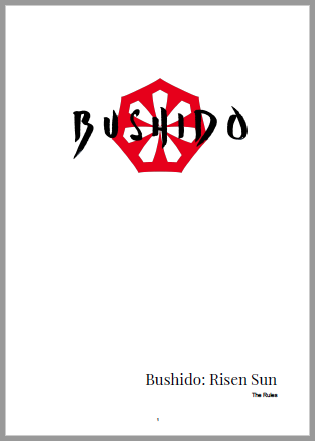 We are hosting a Bushido tournament on Saturday 9th February and day passes are available, will you be joining us to compete for Silvermoons and glory?